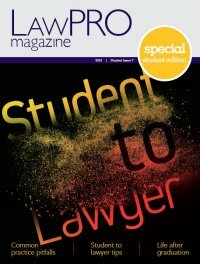 On the 15th anniversary of the practicePRO® program, LAWPRO® asked Dan Pinnington, vice president, claims prevention and stakeholder relations, to give us his personal views on the future of legal practice. This is a topic Dan monitors constantly: One of his main tasks for many years has been to predict where the Ontario bar is headed and what minefields may be encountered on that journey. Dan’s views will be exciting for many readers, although some may be daunted by the challenges ahead, including for the regulators of lawyers. Currently there is a lot of discussion about changes in the practice of law and the future of the legal profession. When you are in the midst of changing times, it can sometimes be hard to see the changes that are occurring, much less understand where things are going. For some perspective, it can help to look at the before and after. For the before, consider your parents’ lawyer. He (and that lawyer was most likely a “he”) lived in the same community and had an office around the corner from where your parents lived. He was educated in Canada and admitted to practice in the province where your parents resided. He was likely a general practitioner and all his work was done in person or on paper. He was also probably a member of the local men’s service and golf clubs (as was your father). And last, but not least, he was subject to regulation and ethics rules and had malpractice insurance (at least in recent decades). For the after, consider your child’s “lawyer.” He or she will live somewhere in the global village that our world has become. He or she was educated and could be located anywhere on the planet. No paper here – electronic documents and virtual communications will be the norm. In fact, this person could be a non-lawyer, and might not even be a person: The advice could be coming from a website or computer program. It is unlikely that this person, website or program will be admitted to a bar, subject to regulation or ethics rules, or have malpractice or similar insurance in the same way as your parents’ lawyer. There are some fairly obvious differences in these two scenarios, and when you consider them more deeply, they raise some interesting and profound questions about what legal services are, who delivers them, and how they will be delivered and regulated. But before we talk about the future, we should start with some reflection on where we came from – the time when your parents’ lawyer was in his prime. Looking back, it would appear that the latter part of the 20th century was the golden era of the traditional law firm. Aside from a few big but temporary bumps, the economy grew steadily for several decades. Lawyers were the only game in town for legal advice and services as they were the only ones with access to the required knowledge and tools. In almost all areas of law and for firms of every size and type, from the biggest firms on Bay Street to the smaller firms and sole practitioners in smaller and rural communities, this created a steady supply of new clients and a growing demand for the services which only lawyers could provide. Leveraging the billable hour (which increased year after year with few, if any, complaints from clients) and large numbers of hard-working articling students and associates, most firms were profitable and being a lawyer meant you were reasonably or very well off financially. In general, life was very good for lawyers and law firms. But as we start the second decade of the 21st century, this idyllic existence seems to be coming to an abrupt end. By many measures, the legal system is not functioning as it should. It has become very complex. Going to court is incredibly time consuming and expensive. Self-represented parties are struggling to handle their own matters and are described as bogging down the court system. There is a large legal services gap, even for the middle class. Many people are unable to afford or access the legal services they need. Some are going outside the judicial system for dispute resolution. There is also a shrinking demand for traditional legal services. Clients (and in particular, corporate clients) are paying a lot closer attention to their legal costs. They have come to recognize that the billable hour rewards the wrong behaviour and does nothing to encourage greater efficiency. Clients want greater predictability and value for their legal spends. They are doing cost/benefit and risk analyses, undertaking RFPs and are demanding more affordable legal services and alternative fee arrangements (e.g., flat or fixed fees, blended rates, phased fees, fees with a collar1, value fees, etc.). Many corporate clients are doing more work in-house. These things are creating pricing pressures and are decreasing the profitability of law firms. Reduced demand for traditional legal services (typically billed by the hour) also means there is less demand for articling students and a tendency towards over-supply of lawyers (while paradoxically at the same time, many rural and smaller communities don’t have enough lawyers). Competition between law firms is increasing for both getting clients and keeping good lawyers. For a variety of reasons there is also a breakdown in traditional law firm structures. With fewer articling students and associates, firms are becoming top-heavy and the pyramid model is no longer working financially or for work-flow structures as demanded by corporate clients, who often do not want to pay for multiple lawyers on a file and certainly do not want to pay to train associates. When you consider outsourcing, some are suggesting firms will move to the “starfish” model, with few permanent lawyers and staff, but a range of outsourced suppliers, independent contractors and temporary employees who come and go as the work demands. Some firms are experiencing succession planning issues as fewer lawyers are moving up the ranks and willing to take on equity partner and leadership roles. Globalization: Both corporate and individual clients (who might themselves be from outside Ontario) are more likely to have matters involving non-Ontario law and parties. Demographics: The profession is aging and there are large numbers of lawyers approaching retirement age. This is a significant issue in many smaller and rural communities because younger lawyers are not starting up new practices in these communities. Technology: The internet and other technologies are having a disruptive impact, allowing many new ways for lawyers and clients to communicate and collaborate and opening the door for new types of legal service offerings. Self-help and DIY tools: The internet has given individual or consumer clients access to virtually all the legal information and resources that only lawyers could access just a few decades ago. legal services and how they should be regulated. Let’s look at these pressures, questions and challenges in more detail. Who will provide legal services? Our current legal system is predicated on lawyers – and more recently paralegals – delivering “legal services” (the definition of this term is discussed in the next section). Can Ontario lawyers maintain a monopoly on professional legal services? The answer is probably not. In fact, some would argue the monopoly ended when paralegals were given regulated status to provide legal services. As mentioned above, access to justice is a problem for many members of the public and there is a massive and growing legal services gap. Lawyers and the legal system do not seem to be changing or evolving to address this gap adequately. This effectively opens the door for non-lawyers to fulfil this unmet need for legal services. Ontario was very progressive in regulating and licencing paralegals. British Columbia is considering the same issue and notaries already do much of the residential real estate conveyancing work in B.C. Non-lawyers are stepping up to provide legal services in other jurisdictions, too. Washington State has created an education and professional framework for Limited Licence Legal Technicians (“LLLTs”). LLLTs will have more training and responsibility than the paralegals in that state, but will not appear in court or negotiate on behalf of clients. California and several other U.S. states are looking into doing something similar for immigration consultants. Computer programs and websites are already providing various types of legal services and it appears they will become a much larger part of the legal services market in coming years. In both paper and electronic form, “DIY” will kits are widely available. The online segment seems poised for very significant growth as there are many start-ups targeting the legal services market, some with capital backing from venture capitalists and major corporations like Google. Sites like RocketLawyer have become major legal services players, selling standard forms and documents that are customized for a client. Some sites offer pre-fab work product that is ready for client use “as is.” There are many sites with self-help information and many Q&A sites where you can directly ask a lawyer questions. You can talk to a lawyer in real time and be billed by the minute on your credit card on Ingenio. Other sites offer lawyers the opportunity to bid on matters or work that potential clients have posted. Cybersettle is a consumer settlement and payment site that has, without lawyer involvement, facilitated the settlement of almost $2 billion in claim-based transactions for insurance companies, Fortune 500 corporations, and municipalities. The services offered by these types of sites are usually significantly cheaper than comparable services offered by lawyers, and in some cases are free. They have transformed many common types of personal or consumer legal work into low price, low margin and high volume commodity legal services. Many of these sites are monetized, at least in part, by being a source of referrals for lawyers (this raises ethics issues in many jurisdictions), and in some cases non-lawyers, that own or participate on them. Most of the websites offering legal forms at the present time are doing basic document automation on common documents like wills, incorporation forms and basic court pleadings. However, work is being done to build intelligent document and advice generation systems that will have artificial intelligence. These systems will be able to handle very complex matters. But, can computers give competent legal advice? So it looks like we will have non-lawyers and computers becoming a much larger part of the legal services market. Will lawyers still provide legal services? Yes, they will still have a part, albeit probably a shrinking part. This is discussed in more detail in the last excerpt of this article. For the rest of the article we will call anyone or anything that provides legal services a “legal service provider.” What do legal services providers do? They provide legal services. Perhaps the more relevant question here is “What is the practice of law?” Coming up with a definition of the practice of law has proven to be very difficult. Many have tried, and many have failed, including an American Bar Association Commission. For the purposes of this article we won’t attempt to come up with the definitive definition of the practice of law. Let’s just say that the practice of law includes giving legal advice. We also won’t attempt to define what “the giving of legal advice” is other than to say it is what lawyers have traditionally done. The key point to note is that the practice of law or the giving of legal advice is important as either triggers inclusion in the legal services regulatory regime. But, what about the services offered by some of the newer forms of legal service providers? Is a legal forms site that helps you complete a document giving you legal advice? How about an answer to a query you posted on a legal Q&A site? Or when a problem with your online purchase is resolved with an online dispute resolution process? Is a software program that creates a document tailored to your facts giving you legal advice? In many cases these websites and online tools are doing work that is the same or very similar to what lawyers do. However, if you take a look at the terms of service on online legal services sites you will find they all explicitly say they are not practising law or providing legal advice. It almost seems as if incremental unauthorized practice of law (known as UPL) is chipping away at the foundations of the legal profession. This leads to the tomorrow’s question: Should legal service providers be regulated? 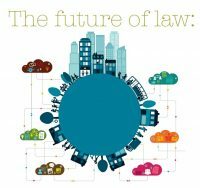 So what will the law firm of the future look like? There are a number of possibilities, some that will be similar to or evolve from existing types of firms, others that will be entirely new. Should legal service providers be regulated? By stating that they are not practising law or providing legal advice, legal service providers shrewdly aim to take themselves out of the current legal services regulatory scheme and nicely avoid all the education, admission, ethics and insurance obligations that lawyers must fulfill. You can better understand the impact of this if you go back to the “before” and “after” scenarios outlined in at the start of this article. Your parents had some guarantee as to the quality of the legal services they got, and some recourse if there was a problem. If the legal services your child gets come from a legal service provider that is outside the regulatory framework, it is quite possible they will have no guarantees as to the quality of the legal services they will get and little or no recourse if there is a problem. For the sake of consumer protection, this suggests that all legal service providers should be regulated. For this reason, ultimately regulators may look to regulate all legal services providers – not just lawyers. This “entity regulation” has started to happen in some jurisdictions. The alternative business structures (“ABS”) approach in the United Kingdom is one example of this. When considering the regulation of legal service providers, two other related questions come up. First, should legal service providers be on the hook if they make a mistake? As a matter of consumer protection, the obvious answer to this question is “yes.” There can be very significant legal, financial and/or personal consequences if there is a problem with the legal services provided to a client. Buying legal services is different from buying running shoes on Amazon or trinkets on eBay. The terms of service on almost all online legal service provider sites have very broad waivers of liability. At best there is a money-back guarantee. This would not properly compensate a client that has been seriously harmed by erroneous legal services (e.g., a will purchased for $30). In most every jurisdiction, including Canada, legal services regulation is very much based on jurisdiction – you must comply with the regulatory regime in the jurisdiction where you are providing legal services. In Canada we have mobility rules which allow lawyers to practice across the country. A similar regime is in place in Europe, but this is not typical of most jurisdictions in the rest of the world. Mobility is difficult if not impossible in most other jurisdictions, including the United States, although there are signs that this is starting to change in some places. For example, discussions are ongoing about legal services falling under GATT, the General Agreement on Trade and Tariffs. However, the current regulatory model doesn’t work well in the world of your child’s lawyer. This is because your child’s lawyer could easily be a non-lawyer or computer, and may be outside of Ontario. Practically speaking, this puts such legal service providers beyond the reach of any Ontario regulation, education, ethics rules and insurance requirements. And it gets even more complicated when you deal with matters involving multiple jurisdictions. Which jurisdiction is relevant if an Ontario resident purchases a lease document for a Florida condo from an online forms site owned by an Irish company (not a law firm) with servers in Germany? Dealing with the complications that the “different jurisdictions” issue raises will have to be sorted out by legal service regulators. Presumably they will look to a jurisdiction where the matter has some physical or virtual nexus. And we may ultimately need some kind of international regulator or enforcer – like an Interpol for legal services providers. Big changes – positive and negative – have happened to the profession in the past. We have gone through economic cycles and seen both emerging and disappearing areas of law. Court rules and procedures have changed. There was the consolidation and growth of big firms and the general movement from general practitioners to specialists. Technology has – and will continue to – change the profession and the delivery of legal services in many, and sometimes very disruptive, ways. No one can really predict for sure how fast change will come to the legal profession, nor with any certainty, the exact changes that will occur. There are many uncertainties. What will the global economy look like? Which purchase and delivery models will develop for legal services? What type of regulatory and compliance environment will exist? To what extent will non-lawyer legal service competition move upstream into areas traditionally served by lawyers? Will the legal profession face deregulation? The one thing that is certain is that significant changes are coming to the profession in future years and decades. They will occur at different times and in different ways in different jurisdictions. While we are very progressive in Ontario in some ways (e.g., mobility and the regulation of paralegals), we have seen relatively little impact from some of the other big changes that have occurred or are occurring elsewhere (e.g., legal process outsourcing, which has taken off in the U.S. and Europe). Considered from a global perspective, Ontario is a small and relatively isolated jurisdiction which may delay some of the changes coming our way. Our comparatively healthy economy and isolation protected us from the financial stresses and changes U.S. law firms and their clients experienced in the downturn that happened there. But when change catches up to us, it will come quickly. It will not be easy for many to face these changes. The status quo is coming unstuck. Based on a review of what has happened elsewhere, some lawyers will lose their jobs. Entire practice groups will become unprofitable and will have to be abandoned, and some law firms will fail. Not all law school graduates will be able to get jobs. Institutions and businesses associated with the legal industry that fail to evolve will also face hard times. For lawyer associations, CPD providers and publishers that may mean offering memberships or services to non-lawyers. Our systems of adjudication (whether courts or administrative tribunals) need to adapt and change as well. They need to be simpler, more accessible, easier to navigate and faster. Adding more self-help options could help those without lawyers. Lawyers tend to be slow to change and it seems many lawyers don’t see or won’t acknowledge the changes that are coming. Some think they are different or they say that their matters are “unique” and require the services of a lawyer. Lawyers should not fool themselves: The basic market forces of supply, demand and pricing apply to them. There is an oversupply of traditional and high (some say over) priced legal services. The client demand for lower-priced legal services is being filled by the new types of non-lawyer legal services providers. Lawyers and law firms need to recognize that changes to the legal services market are occurring and embrace them. People will always need lawyers, or something like them, for some types of matters. For “bet the company” work there will always be a solid and lucrative demand for services, but it is a very small part of the legal services market. In the middle comes relatively sophisticated or higher value work that is not rocket science but needs a firm that has specialized and competent people. This too is a market that won’t disappear, but it is not a huge one. At the bottom is the largest part of the market – the commodity work we have discussed above: people buying houses, preparing wills, settling estates, resisting eviction or prosecution, and so on. Many people can’t afford the legal services or get the help they need in our current system. These unmet legal needs are an opportunity that lawyers and law firms must recognize. Lawyers need to innovate and think like business people and entrepreneurs – this is what their non-lawyer competitors are doing. That will mean looking at offering new services. It almost certainly means using technology to work better, faster, cheaper, and in new ways. To compete with legal service providers who are offering commodity services, lawyers must offer more affordable services. Options include going head-to-head by retrenching to offer commodity services to clients as well or by exploring alternative fee arrangements to make existing services more affordable. Another option is to put more effort into showing clients the value add that having a lawyer brings to legal services. This involves thinking beyond just doing one matter for a client and thinking about what the client’s longer term needs are. In other words, when a new client walks in, don’t think of just doing an incorporation that will pay a few hundred dollars in fees. This is commodity work. Think about what a new business person will need for the short- and long term growth and success of his or her business. What information could be provided to the client to help them deal with issues they may come across? What related work can be recommended to them? Think beyond one matter – aim to become the business lawyer for the client’s new company. This is where the longer term and more lucrative fees are. A client won’t get service like this from a $50 incorporation done on a forms site. As a closing thought, we turn to a comment Richard Susskind made in his book, The Future of Lawyers? He suggests lawyers need to move from being reactive legal problem solvers (the ambulance at the bottom of the cliff) to proactive legal risk management advisors (the fence at the top of the cliff). Consider how prepared you and your firm are to face the changes that are coming to the legal profession. No doubt you have some work to do. Take proactive steps to face these challenges and the opportunities they present.